Cubs Throw Back to 1937! Will the Brewers Follow Suit? 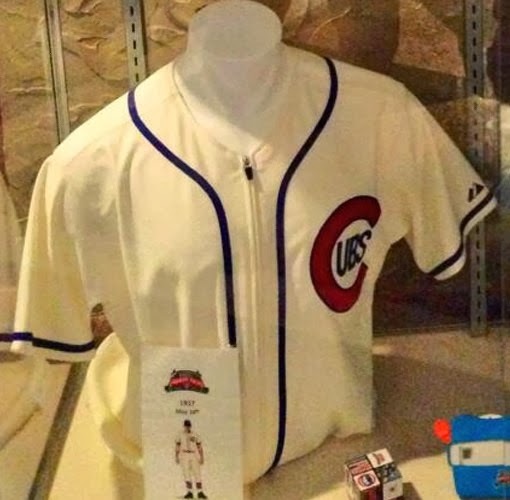 Just minutes ago, the Cubs unveiled the series of throwback uniforms they will be wearing next season for Wrigley Field's 100th Anniversary. And, not incidentally, superior to their current cluttered mess. 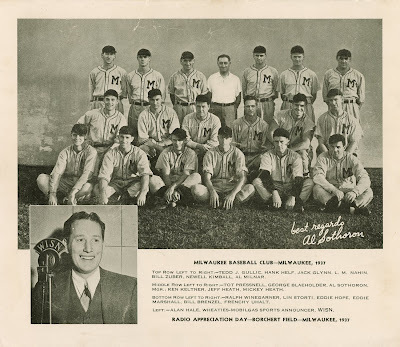 I believe those are indeed the road uniforms in the Radio Day promotional photo - contrast the relatively dark flannels with team president Louis Nahin's white shirt top row center. 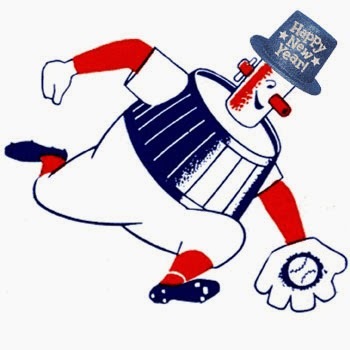 Information on the Brews' uniform history is spotty, aside from what I've been able to piece together (I know, I'm working on it). This photo, at right, of local phenom Ken Keltner (from the collection of Paul Tenpenny) was taken in Spring Training of 1937, but reflects what I believe was the 1936 road uniform. It wasn't unusual for the team to receive new uniforms right before Opening Day, presumably so they looked their best for the first home game. 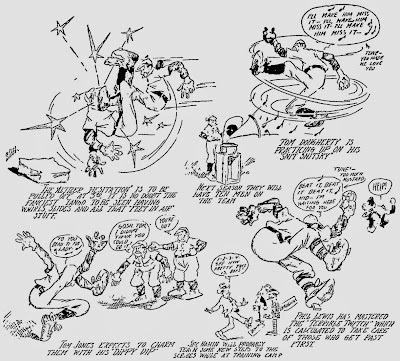 Offered is a broadside letting fans of the Milwaukee Brewers baseball club, then a minor league affiliate of the Boston Braves in the American Association, know what their options were for catching a game on tv or the radio if they couldn't make it down to Borchert Field in person. Sign measures 17" x 21" and reads as follows, "Gimbels Brings You Brewers Baseball Play-By-Play on Radio WEMP featuring Mickey Heath and Television WTMJ-TV featuring Larry Clark" over a green diamond with a baseball scene featuring a sliding runner, a middle infielder and an umpire. 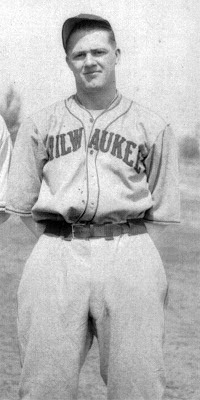 Radio voice Mickey Heath played with the Cincinnati Reds in 1931 & 1932 and also served as the Brewers player/manager in 1939 among numerous other minor league stops while TV Man Larry Clark was the first to broadcast play by play of baseball games in the state of Wisconsin. Broadside remains in good to very good overall condition with a few small areas of staining present. Mickey Heath is well known to our readers. He come to Milwaukee as a first baseman in 1937. 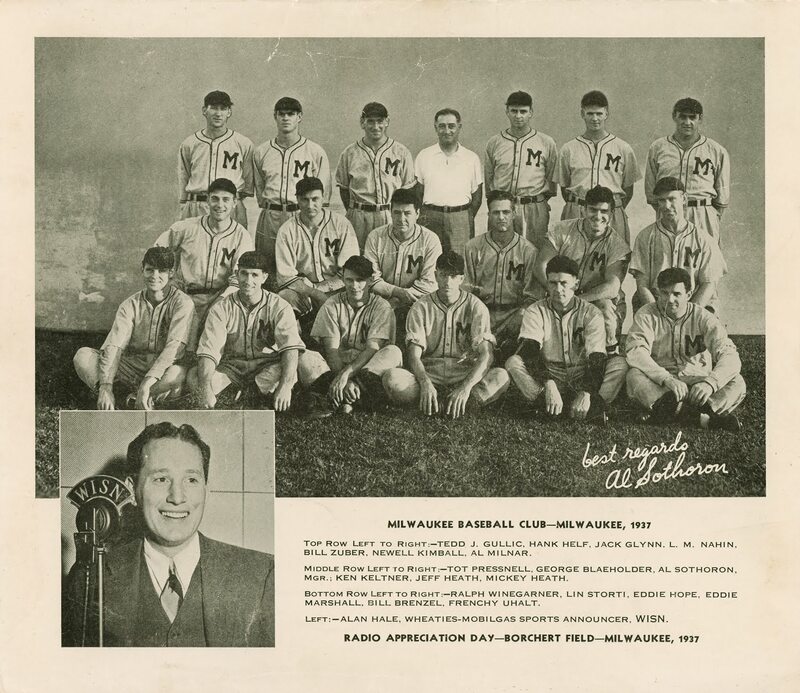 In November of 1938, club president Henry Bendinger fired club skipper Alan Sothoron and made Heath a player/manager. Heath did both jobs at the Orchard for a year and a half until he too was relieved of his managerial duties partway through the 1940 season, at which point he quit altogether. 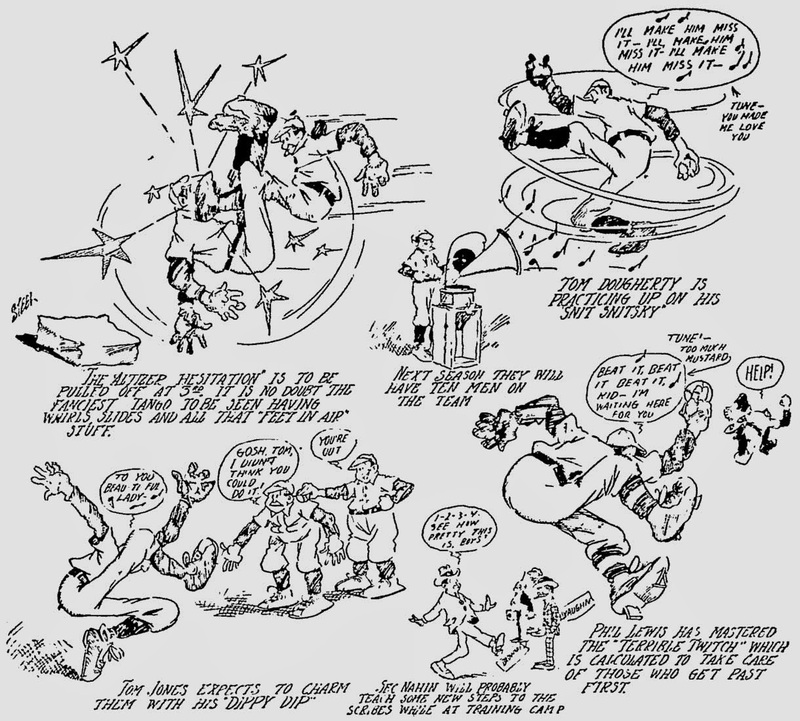 He went into radio and was hired back in 1942 as a part-time coach and full-time radio man. He was the voice of the Brewers through 1950. On the television side, Larry Clark started with the club in 1948, not 1947. In that year, Milwaukee only had an estimated 700 television sets, most of them in taverns. WTMJ was only the eleventh commercial television station in the United States, and Milwaukee was the seventh American city to have its own station. 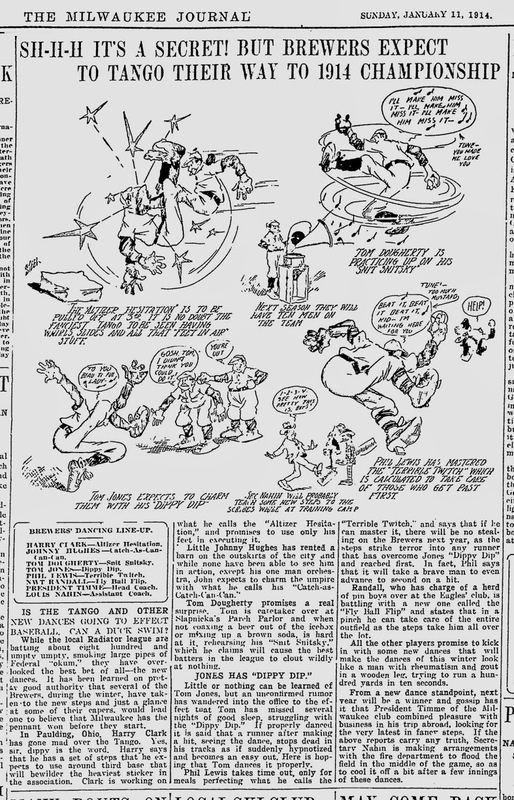 In those early days, Clark was paid $10 a game to sit in a small booth on the Borchert Field roof and call play-by-play to fans gathered around those few hundred sets in bars and appliance store windows. According to reports, there were no Brewer broadcasts in 1951 or 1952, which sets an upper date of 1950. Visually, it's interesting but not terribly impressive. It's three-color printing with stock graphics (a "B" team versus a "C" team? They couldn't be bothered to airbrush in a Milwaukee "M"?). 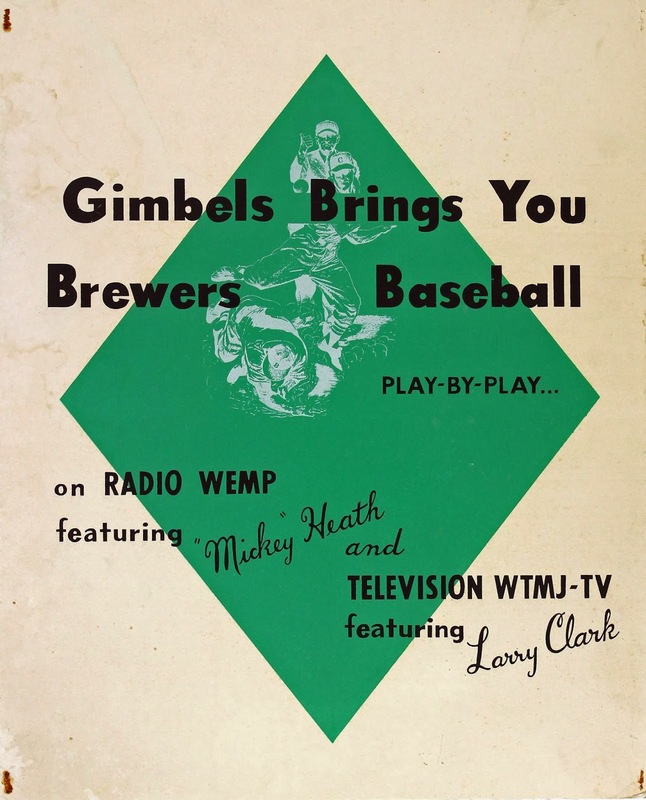 As a piece of Milwaukee's baseball and media history, on the other hand, it's invaluable.